A small, tufted, grasslike plant of wet meadows and bogs, with numerous fibrous roots and flat, linear, grasslike leaves 4 to 15 inches long. Flowering scapes as long or usually much longer than the leaves. Sometimes over a foot tall, bearing at the summit a dense, ovoid, obtuse spike of coriaceous, overlapping bracts or scales. Flowers bright yellow, about one-fourth of an inch broad, on short, slender peduncles; each flower consisting of three oblong divisions to the corolla, three stamens inserted on the corolla and a three-branched style. Flowers appearing from the axils of the bracts comprising the spike. In swamps, bogs and borders of streams from Maine to Florida and Louisiana, mostly near the coast. Flowering from June to August; in New York usually flowering in July. Several closely related species are recognized by botanists. Xyrisflexuosa Muhlenberg, of about the same range, has the scapes bulbous-thickened at the base. 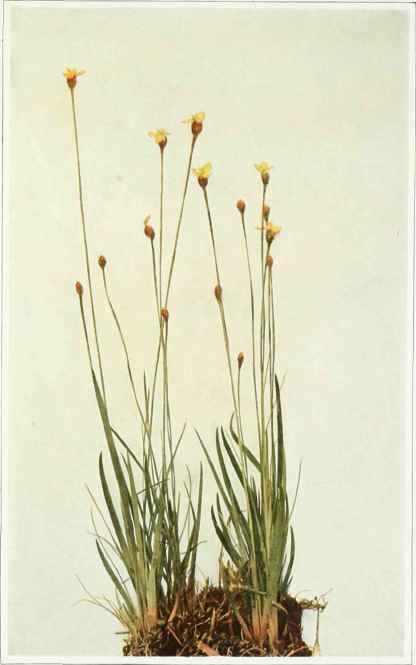 Xyrisraontana H. Ries, in bogs from Nova Scotia to Michigan and Pennsylvania, is frequent in the mountainous parts of New York, and resembles very closely the Carolina Yellow-eyed Grass.